People on the Southbank in London yesterday were able to pick out cash from a giant frozen billboard erected by Birds Eye in a PR stunt to promote frozen food. 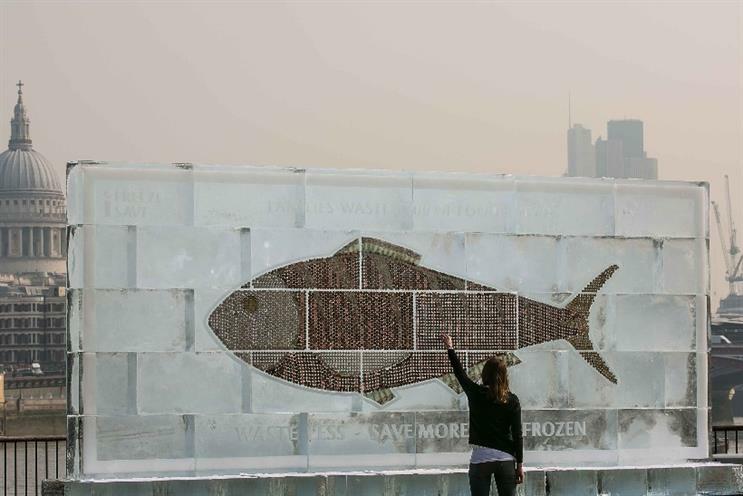 The food brand, best known for its fish fingers and peas, created a giant 20ft ice block with coins and notes frozen inside to raise awareness of food waste and encourage consumers to use their freezers. The four-tonne ice block, which took over one month to freeze and eight days to build, contained £700 cash - the amount Birds Eye claims consumers would save if they froze surplus food instead of binning it. Passers-by were able to pluck out the cash as the ice melted in the sun. The activity was designed to launch Birds Eye's new marketing campaign -iFreeze, iSave, which aims to show people they can save money by freezing food. The brand has created a digital hub with freezer tips and a TVC will run until May. "We’re incredibly excited by this campaign as we understand the pressures families are under to save money," said MD Andy Weston-Webb. "Reducing food waste by making the most of the freezer will not only help families to do so but it will also help the UK to become more sustainable and resourceful, something we’re very proud to be a part of."